Helena Rose Geoghegan, 88, of Natick and a former longtime resident of Sherborn, died Thursday July 19, 2018 at Mary Ann Morse Nursing and Rehabilitation Center in Natick. Born in Framingham, she was the daughter of the late James D. and Helena B. (Devitt) Geoghegan. Rose will be remembered by her family as a happy and upbeat person who was very close to her many nieces and nephews (very conscious of their birthdays and life events) and who loved family parties. She worked over the years at the family business, Sunshine Dairy in Sherborn, and in housekeeping at Kathleen Daniel Healthcare Center and at Bethany Hospital. 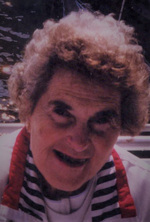 Rose was a longtime member of the Framingham Catholic Women's Club through St. Stephen's Parish. She is survived by her siblings: Lawrence Geoghegan of Sherborn, Jane Cosman of Sherborn and Thomas Geoghegan of Framingham; and many nieces, nephews and cousins. She was the sister of the late: Margaret Baker and the late Mary O'Rourke. Visiting hours are Monday, July 23rd from 4:00 to 7:00 p.m. at Boyle Bros. Funeral Home, 173 Union Ave., Framingham. A funeral Mass will be celebrated Tuesday, July 24th at 10:00 a.m. at St. Stephen's Church, 221 Concord St., (Rte. 126) Framingham. Burial will follow in the family lot at St. Stephen's Cemetery, Fenwick St., Framingham.